For Christmas last year, my sister fulfilled one of my biggest lemmings and generously gave me the Deborah Lippmann Get This Party Started set. Unfortunately it took so darn long in getting here it didn't arrive until Christmas had truly come and gone so it was more like a New Year gift! Oh well. As you know, I ADORE glitter and I've wanted this set since I first read about it so I was super excited to receive it! 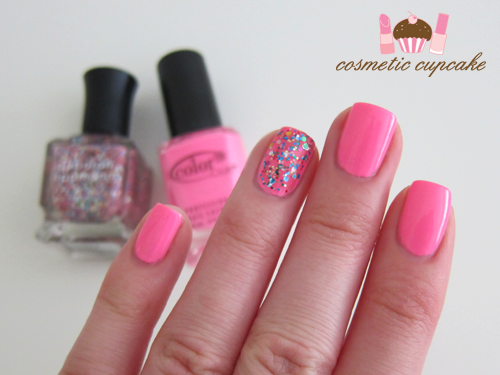 The glitter I wanted to try out most was Candy Shop and I used it for a quick bright mani before I went on holiday. For this mani I used 3 coats of the awesome Color Club Yum Gum which is from their 2010 Wicked Sweet collection. It's a cute bright bubblegum pink polish (almost neon) and the scent is actually really nice!! It's such a fun colour and as you know I love these types of pinks x) Yum Gum applied smoothly and dry time was excellent. I then added 1-2 coats of Candy Shop to my accent finger which is the same hex glitter as the famous Happy Birthday but in a bubblegum pink base. LOVE IT!!!!!! 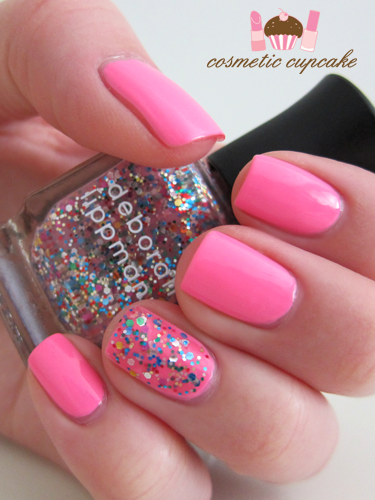 Are you a fan of Deborah Lippmann glitters like I am? What's your favourite? love these!I think the pink one is growing on me thats bad for my wallet! gorgeous combination! I'd love to add all of these glitters to my stash! i love candy shop - i also love across the universe! LOVE it! <3 So pretty! Really like this one. 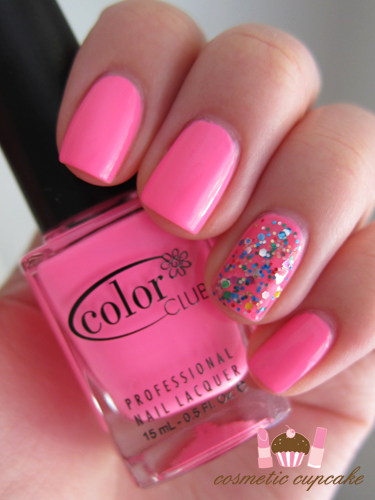 Love the pink and that tiny touch of glitters. It's so sweet! I love it! I've always wanted to get a DL glitter, but still don't have one for my collection. Yum Gum looks like a great base for Candy Shop, though it might be too much of a neon for me. I have always wanted to try these! Where do you get Deborah Lippmann from? That pink color is so beautiful!